And Toyota says it could go even faster on a longer runway. 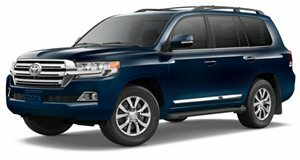 The Toyota Land Cruiser is a reputable SUV, but it isn’t one you associate with speed. That was until last year’s SEMA, when Toyota revealed the heavily modified Land Speed Cruiser. Forget off-roading because, as the name suggests, the Land Speed Cruiser was designed for one sole purpose: to go faster than any SUV before it, thanks to its insane 2,000-horsepower V8. Now the Toyota Land Speed Cruiser can officially be declared as the “World’s Fastest SUV” after reaching a record-breaking speed of 230 mph. Behind the wheel of the Land Speed Cruiser was former Toyota NASCAR driver Carl Edwards, who achieved a GPS-verified speed of 230.03 mph on the 2.5-mile runway at the Mojave Air and Space Port in Mojave, California. The Land Speed Cruiser started out as a stock SUV before being heavily modified by a team of engineers at Toyota’s Motorsports Technical Center. Using the standard 5.7-liter 3UR-FE V8 engine as a starting point, they added a pair of volleyball-sized Garrett turbocharged capable of producing up to 55 PSI of boost. Such extreme force induction required sturdier pistons and rods and a custom-made intake manifold fitted to the engine internals. A custom racing transmission was also fitted to cope with the extreme power. Of course, you can’t make such extreme modifications to the engine and expect the Land Speed Cruiser to still be drivable. To improve the aerodynamics, stability, and controllability, the SUV was lowered significantly, and the frame was narrowed by three inches to allow wider Michelin Pilot Super Sport tires to be fitted. On its first run, Edwards hit 211 mph matching the previous record. Hoping to beat the record, engineers increased the boost and the Land Speed Cruiser hit 230.03 mph before it ran out of runway. “At 225 mph, the thing was wandering a little bit,” said Edwards. “All I could think was that Craig said, ‘No matter what, just keep your foot in it,’ and we got 230 mph. It’s safe to say that this is the fastest SUV on the planet.” You would think, then, that the team would be satisfied with that title, but Toyota says that the Land Speed Cruiser could go even faster on a longer track.